Joe Andruzzi & Friends Golf Tournament! 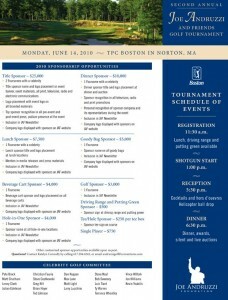 The second annual Joe Andruzzi and Friends Golf Tournament will be played on Monday, June 14th at the TPC Boston in Norton, MA. This is a fun, low-key event — and it will be played on one of the best courses in New England all to benefit The Joe Andruzzi Foundation. No promises, but Joe is hoping to avoid a repeat of last year’s ‘runway golf cart’ episode at the end of the day. Food, fun and fabulous prizes will greet you as you join in the fight to tackle cancer!